Bernie Gunther returns in the thirteenth book in the Sunday Times and New York Times bestselling series, perfect for fans of John le Carre and Robert Harris. 'One of the greatest anti-heroes ever written' LEE CHILD'One of the greatest master story-tellers in English' ALAN FURST1957, Munich. Bernie... read more Gunther's latest move in a long string of varied careers sees him working for an insurance company. It makes a kind of sense: both cops and insurance companies have a vested interest in figuring out when people are lying to them, and Bernie has a lifetime of experience to call on.Sent to Athens to investigate a claim from a fellow German for a ship that has sunk, Bernie takes an instant dislike to the claimant. When he discovers the ship in question once belonged to a Greek Jew deported to Auschwitz, he is convinced the sinking was no accident but an avenging arson attack. Then the claimant is found dead, shot through both eyes. It's a win for Bernie's employers at least: no one to pay out to even if the claim is genuine. 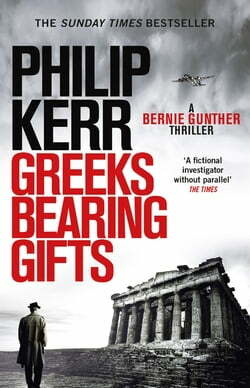 But who is behind the murder, and why?Strong-armed into helping the Greek police with their investigation, Bernie is once again drawn inexorably back to the dark history of the Second World War, and the deportation of the Jews of Salonika - now Thessaloniki. As Europe seems ready to move on to a more united future with Germany as a partner rather than an enemy, at least one person in Greece is ready neither to forgive nor forget. And, deep down, Bernie thinks they may have a point.